Jivamukti Yoga is a devotional practice and most classes start off with singing a mantra. Students are not required to participate. Liberate your body, mind and soul at Jivamukti Yoga Center Jersey City. With two stunning studios and over 70 classes a week, Jivamukti is the gold standard for a complete yoga practice and path to liberation and stress relief in our hectic world. 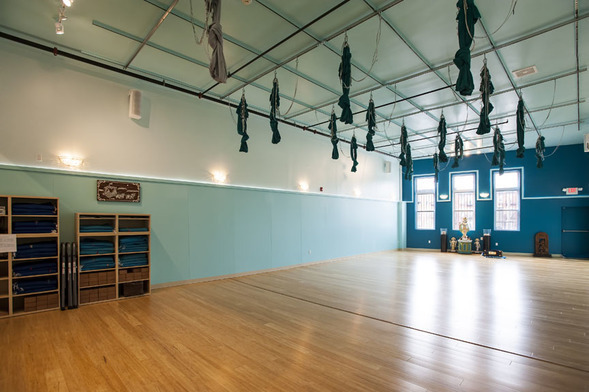 Jivamukti Yoga Jersey City is a franchise of the internationally acclaimed Jivamukti Yoga Brand developed by Sharon Gannon and David Life. It is a space for spiritual and community activism. It also offers free meditation classes, lectures, events, and instructional classes about yogic philosophies and principles. The boutique sells yoga props, clothing, jewelry, books and cd/dvds. The Jivamukti Yoga Center is a gathering place for everyone, regardless of age, religion, ethnic background, sexual identity, or political persuasion.